Monongalia County Health Department's Training Center is an attractive and comfortable facility that has everything needed to host a successful meeting or training class. Equipment includes a computer, digital projectors, SmartBoards, a document camera, and a sound system with wireless microphones. The Training Center offers classroom seating for up to 60 people and with additional perimeter seating of 36. The room can be separated in half for smaller meetings or multiple group sessions. A lunch/break room and ample restrooms are conveniently located near the Training Center. The MCHD Conference Room is a large multi-purpose room with folding tables and chairs that can be arranged to suit. The room can comfortably seat around 40. Available equipment includes a projector, whiteboard, and a built-in sound system. 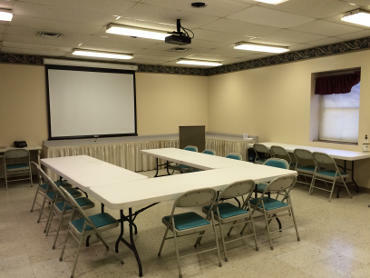 The Conference Room is often used in conjunction with the Training Center as additional meeting space or for luncheons. Please contact Terri Berton at (304) 598-5138 to make arrangements to use our meeting facilities.